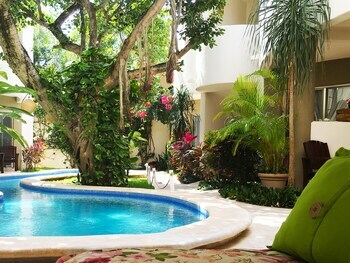 With a stay at Hotel Posada 06 Tulum - Adults Only, you'll be centrally located in Tulum, within a 15-minute drive of Tulum Mayan Ruins and Tulum National Park. Featured amenities include express check-in, express check-out, and a 24-hour front desk. A shuttle from the airport to the hotel is provided for a surcharge (available 24 hours), and free self parking is available onsite. Located in Cabo San Lucas (Downtown Cabo San Lucas), this apartment is within a 10-minute drive of Land's End and The Arch. Free self parking is available onsite. With a stay at Motel Costa Express in Cancun (Downtown Cancun), you'll be within a 15-minute drive of La Gran Plaza Shopping Mall and Las Plazas Outlet Cancun. Free self parking is available onsite. With a stay at Hotel Las Nubes in San Cristobal de las Casas, you'll be within a 5-minute walk of Mayan Textile Center and Ex-Convent of Santo Domingo. With a stay at Hotel Dulce Luna in San Cristobal de las Casas, you'll be a 4-minute walk from Santo Domingo Handicraft Market and 7 minutes by foot from Arches of Carmen. With a stay at Casa Xantolo Romantic Zone in Puerto Vallarta (Romantic Zone), you'll be within a 15-minute drive of Malecon and Olas Altas Street. Free self parking is available onsite.